Service Costs > How Much Does Trenching Per Foot Cost? How Much Does Trenching Per Foot Cost? Trenches are created for a variety of reasons, but for the most part, these trenches are dug to install cable lines and to help install drainage, electrical, and sewage systems. Trenching can be done with the use of hand-trenching tools, trenching shovels, walk-behind trenchers, bed edger trenchers, wire trenchers or ride-on trenchers. Manual trenching is often done for minor projects, and for bigger tasks, renting a trencher is often the first option. Manual trenching is often done for minor projects, and for bigger tasks, renting a trencher is often the first option. How much does trenching cost? The costs of digging a trench will depend on the soil, how deep it will be, what’s being installed, the machinery being used, and if any obstacles, such as rocks or roots, exist. On average, the cost of digging a deep three-foot deep trench can range anywhere from as little as $2 to as high as $10 per foot, with most contractors, depending on the equipment needed. This average will include the minimum daily charge most contractors will charge to come to your location to begin the job. In most cases, always be prepared to pay at least $100 for a contractor to even start digging or even more if you were to require something larger than a Ditch Witch. Generally, the longer the trench is, the lower this price can be. A contractor expert on JustAnswer.com answered this very question, saying a 10-foot long trench with soft soil and limited space could cost about $1,000 to $1,200, bringing the total to about $100 per foot. However, if the trench were 500 feet long and a ditch witch were used, then the costs could be less than $50 per foot or even less, again, depending on the soil. WirelessEstimator.com, for instance, says the costs can vary depending on the width and depth requirements, but for the most part, it’s best to charge $4.70 per foot for the trench digging only. These costs could increase if the contractor had to remove any rock or excess concrete in the path. This estimate won’t include the conduit or conductor placement. On another forum thread, MikeHolt.com, a forum member said you should be prepared to spend $1.50 per foot, per foot. A one foot long, two-foot deep trench, for example, would cost $3. Of course, there would be a minimum involved if you only needed one foot done as a job. Since all jobs are going to be different, consider using free quote search engines such as HomeAdvisor.com. Here, you can explain your job and local, licensed contractors will contact you with free quotes. The estimates mentioned above will include the labor, machinery, trench digging, and in some cases, the backfill once the job is complete. Before the job begins, a contractor will inspect the soil conditions and help mark any underground utility lines/obstacles. On average, depending on the method being used to dig the trench, it can take an operator one hour to dig 12 feet that’s five feet deep if using a backhoe. If the trench will only be three feet deep, then this number can double to about 24 feet. If digging by hand, the average skilled contractor could take up to an hour to dig a three-foot-deep trench that’s one foot long. As for small trenches for conduit, these numbers could be much higher. The quotes mentioned above will be for the trench digging only and won’t include any additional materials such as the conduit, water lines, sprinkler, cable/fiber lines and so forth. Permits and inspection fees will more than likely be required before the trenching project can begin. If the operator needs a laborer, this can add another $20 to $40 per hour to the costs mentioned above. 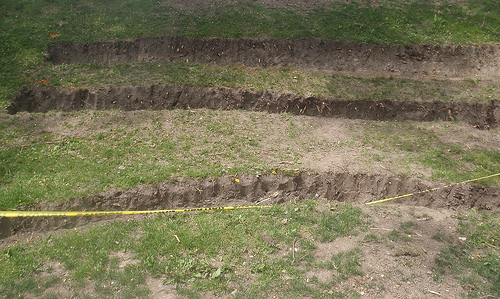 Using our estimates above, plan on 10 to 20 feet per hour being dug, again, depending on the factors mentioned above. Before the trenching begins, you will need to call the local utility companies to mark all underground wires. For a small trench job, consider renting the machinery yourself or even digging by hand. While it can be labor intensive, it could save you hundreds. Just remember: If you plan on doing it on your own, then it’s important to call the utility companies ahead of time to mark any obstacles underground. To rent a small 18-inch trencher at Home Depot, for example, can cost $100~ per day. in some jobs, trenching required shoring, disposal of excavated materials, soil stabilization …etc. so based on that additional factors will control the cost. in other cases, the type of job and quantity of trenching controls the price as well.